Are you tired of using pumpkin in recipes? Why not try replacing pumpkin with butternut squash? 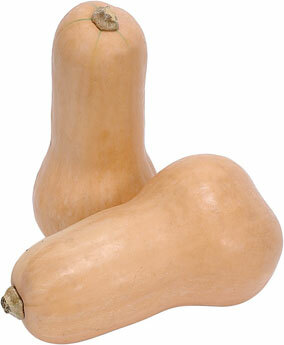 Nutritionally, butternut squash has more vitamin A than a pumpkin, which is good for your skin and eyes. It is also rich in B-complex vitamins, vitamin C, and the seeds are a good source of dietary fiber and mono-unsaturated fatty acids. With only 41 calories in a ½ cup serving, it’s a lot less fattening than its name implies! In the U.S. butternut squash is abundantly available from September through mid- December, but since they are native to Central and South America, they are available year-round. A good butternut squash should have blemish-free skin and feel heavy. Once purchased, the squash will last for several weeks if stored at room temperature, if left intact. Once cut, however, the cut pieces must be stored in the refrigerator where they’ll last for only a few days. ALWAYS use a stabilized cutting board – meaning you place a dampened paper toweling on the work surface, then place the cutting board on top of that. This helps keep the cutting board from swiveling around as you attempt to cut anything. ALWAYS use sharp cutting tools. ALWAYS stay focused on the task at hand! ALWAYS WASH the outer skin of the butternut squash under running water before cutting in order to remove any dust, soil and residual insecticides/fungicides. 1. Since butternut squash has round surfaces, carefully slice about 1/2 inch from the top and bottom, forming a flat surface. 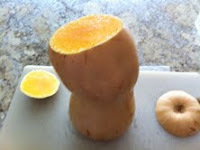 2.Stand the squash upright on the cutting board. Using a vegetable peeler or sharp paring knife, remove the outer skin of the squash by running the peeler or knife downward until all of the skin is removed. 3. With the squash still in the standing position, carefully slice down the middle from the stem end. 4. Lay the squash down on the board; scoop out the seeds and membrane with a spoon. 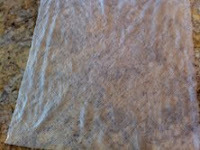 Discard membrane, but save the seeds to roast and eat! Butternut squash can be used in sweet or savory dishes - soups, stews, salads, bread, muffins, ravioli filling, casseroles, pies, pancakes – you get the idea.